This Easter prayer focus was created by a 10-year old and an 80-year old working together. 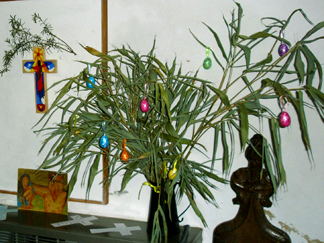 It started out as a bunch of palm leaves on Palm Sunday. On Good Friday a bunch of rosemary was hung over a cross made out of burnt wood. Prayers written on cross shapes and a pastel drawing (made by members of the congregation during liquid worship stations) were placed in the scene. 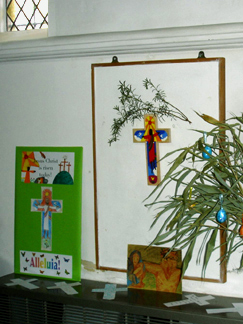 Finally, on Easter Sunday, an image of the risen Christ replaced the burnt cross, eggs were hung on the palm branches, and a board with drawings of Easter symbols was added.